Have you ever been so engaged in an activity that you lost track of time? You were so focused on what you were doing, you look up and realize that it’s been three hours. You didn’t even realize it. That’s a state of flow, or being in the zone. That state of mind where you were doing something you enjoy so much, and are so good at doing it, that you get totally lost in the experience. Flow can be achieved by as many different things as there are people; hiking, job tasks, childcare, you name it. For many veterans, a lot of their time in the military was punctuated by these flow moments. Sports and physical activity can sure do it; going to the range, executing battle drills, teaching your subordinates how to execute a difficult task…one of the reasons that veterans enjoyed the military so much was the opportunity to engage in a flow state, and if you found something you loved and you were good at, then you were able to operate in flow pretty often. There were times, of course, where flow was not in the picture. Think guard duty; An endless repetition of uneventful shifts guarding an ammunition supply point that is in a base that is guarded by others. Or constant police call…picking up trash, for those who never served. Endless repetitions of inspecting vehicles for deficiencies. These are the times when we recall the mind-numbing boredom that went along with military service, and miss those moments much less than the flow moments. It is possible to engineer flow moments in our lives, so that we can get the same satisfaction post military that we did while we were in. The concept of Flow was identified and popularized by Hungaria-born psychologist Mihaly Csikszentmihalyi (pronounced Me-High Chick-Sent-Me-High). It has been variously described, as I have above, as being lost in a task. Being so involved in what you’re doing that you lose track of time. It is doing something just for the enjoyment or positive feelings you get from doing the task. Two of the key elements of the flow state are how difficult a task is, compared to our skill level in accomplishing that task. Think way back to when we were learning to tie our shoelaces. Now, that task is extremely easy; it is so routine that you probably don’t even remember doing it this morning. Back then, however, it was extremely difficult, and our skill at doing it wasn’t very highly developed. Have you ever watched a kid trying to tie their shoes, the look of intense concentration, maybe the tongue poking out of the mouth a little bit? Very quickly, however, the task became easier and our skill became greater; the situation reversed. We were no longer in a state of flow. We became bored quickly; our skill was much greater than the difficulty of the task. Consider the opposite scenario; the difficulty of the task is so great, and our skill at conducting the task is so low, that we become frustrated. I’ve heard veterans feel this way when they go back to school, and get into courses where they just don’t get the material. Very quickly, they become irritated…at themselves, their classmates who seem to be getting this stuff easily, at their instructor. If a task is so challenging that we can’t seem to figure it out, then we quickly lose interest in that as well. The key to engaging in flow is to find something that has a difficulty that is just above or just below your ability. As your ability increases, the difficulty increases. Woodworking, for example; we start off with small projects, just the right amount of difficulty, and increase the challenges of the pieces we’re working on as our skill increases. This applies to many different tasks that we can do in our post-military life, both through employment and hobbies. Running: you start off with a 5k, increase your endurance and distance and eventually you’re running a marathon. Hiking: start with the trails near the house and eventually end up on the mountaintop. You hear stories all the time about veterans who get caught in jobs they hate after leaving the military. 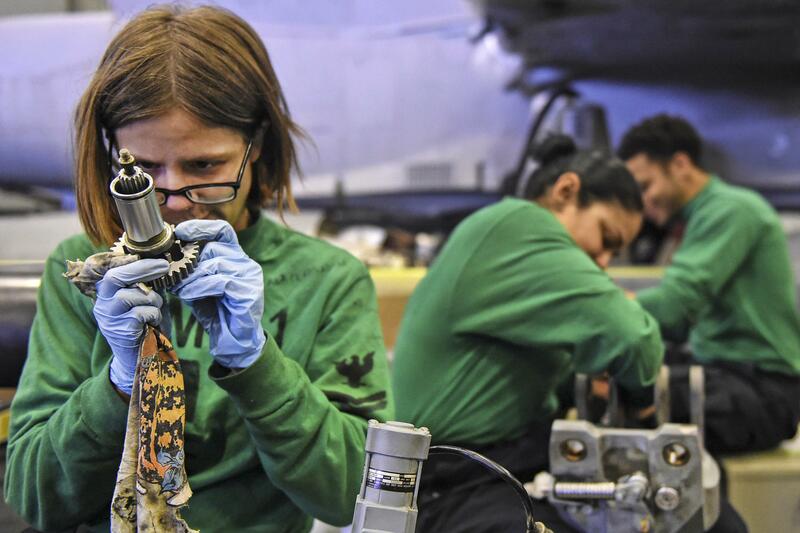 Many times, it’s because these jobs don’t offer the same opportunities to engage in flow states that the veteran had when they were in the military. When your skill…leadership, task accomplishment, quick and precise execution…is greater than the task at hand, then you get frustrated. Just getting the paycheck isn’t enough…veterans need to have intrinsic motivation for the work they’re doing, it has to be personally rewarding. If it isn’t, boredom and apathy quickly sneaks in. Once you understand the concept of flow, you can find things in your post-military life that get you there. It doesn’t just have to be about work; work can be about the money, and other stuff you do can be about flow. Yard work. Taking care of the kids. Hobbies and outside activities. Keep in mind, these things should have both meaning and purpose…they should be both satisfying, and have tasks to be accomplished with an identifiable end result. You can certainly get into a flow state by playing video games for six hours…but have little to show for it at the end of that time. If you engineer flow states, then you’re more likely to experience satisfaction in your post-military life. 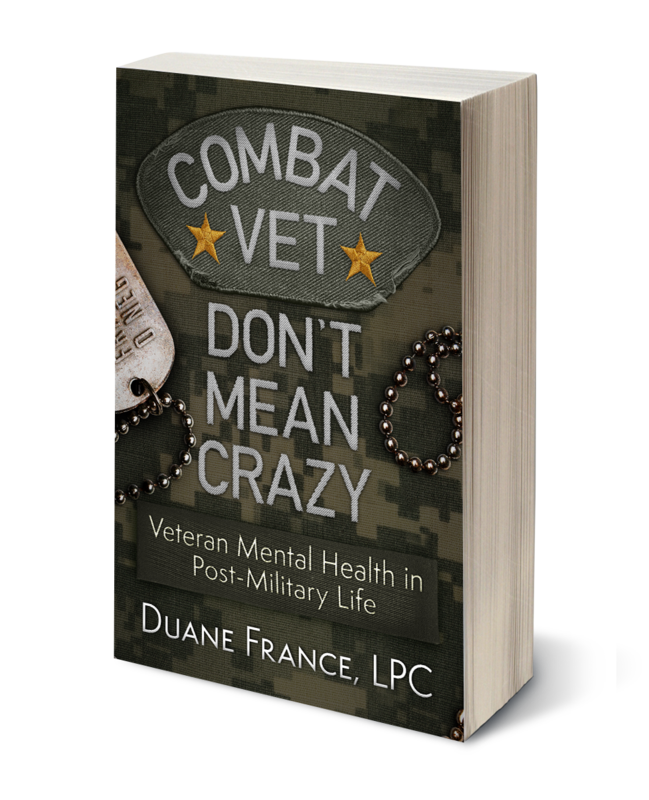 Overall ‘Combat Vet Don’t Mean Crazy’ is a very well written, thought-provoking book. As usual, SFC France did a fantastic job! Being a combat veteran myself who has served in both Iraq and Afghanistan, I feel there’s a lot of powerful information and tools in this book that you can put to use immediately – even as you’re reading this book. Definitely an excellent read on those days of rest and/or distress. 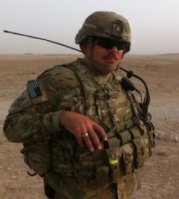 – J.C.
Duane K. L. France is a combat veteran of both Iraq and Afghanistan, as well as a mental health counselor practicing in the state of Colorado. Do you want to join the conversation regarding veteran mental health? Share, like, and comment. Read Duane's previous posts and follow him on Twitter and LinkedIn. Keep the conversation about #veteranmentalhealth going.